We consider ourselves EW 'purists' in the manner of R.N.Elliott's original works (1938) and from the later expanded interpretations of A. Hamilton Bolton (1960) & more familiarly, Frost/Prechter (1978). Our own history of EW begins from the late '80's that has over the years placed more and more focus on geometric 'Ratio & Proportion', measurements that help define each and every EW pattern. Get to know these, and a lot of the subjectivity in defining ongoing price movement disappears. "I often say that when you can measure what you are speaking about, and express it in numbers, you know something about it". 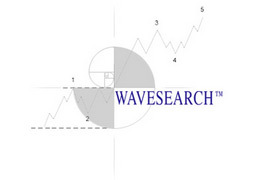 What is different about WaveTrack's Elliott Wave Analysis? 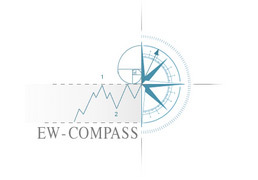 Each and every one of the charts we create builds various Fibonacci ratios & proportions that aim to highlight convergences at specific price reversal levels. Price activity is drawn towards these areas like metal filings to a magnet, as lightening to a 'streamer' – they are the points of 'least resistance' that price activity is attracted to. The charts also stylise themselves on the completion of the entire pattern in progress, so you'll not only see the successive price swings and the defined price targets for each wave sequence but how these form as the components of the larger pattern. This is vital in creating trading strategies - measuring targets and identifying pattern elimination levels to establish risk/reward criteria and position size allocation. 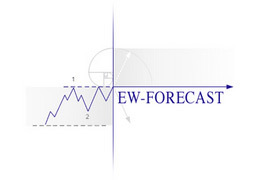 The EW-Forecast software that displays each chart has been especially created to illustrate the entire time-series of each contract (e.g. S&P 500) in the correct hierarchical sequence. This begins from data of quarterly time frames incorporating super-cycle degrees of trend but gradually fractalising into successive shorter periods, monthly (cycle), weekly (primary), daily (intermediate) and hourly (minor) etc. This process eliminates inconsistencies found in varying degrees of trend that you may have noticed from mainstream analysts elsewhere. This is so important in identifying the correct course of price action because the nature of the markets develops characteristics of interdependency – each tiny price action accumulates into ever increasing patterns that are part of the greater whole. A significant short-term deviation from the expected 'model' can have a chain-reaction through the entire time-series and so it becomes critical to merge each together in this way. Click here for more information. One last but important point - through our pragmatic application of the EW Principle to trading, we advocate a risk-averse approach to enacting (trading) any set-up of price-reversal, directional price change – 'never trade the number!". We adopt a three point process - our golden rules are to first await price-rejection from any pre-determined target level, second, qualify with a reversal signature and third, create a stop-loss or negation trigger beyond that point of price extreme (high or low). What is R.N. Elliotts Discovery about the Wave Principle? How to interprete Elliott Wave charts and how do you apply the analysis into a strategic trading plan? Expanding Diagonal Patterns - Do they actually exist?